Radiologist Jim Busch stands in his McCallie Avenue office Friday, October 23, 2015. Dr. Jim Busch got bragging rights Tuesday as the first person in the world to have a 10- gigabit-per-second residential Internet connection installed in his home. At least, that's what EPB announced Friday, exactly one week after the Chattanooga utility announced it would amp up the speed of its single-gig Internet service to 10 gigs for residents willing to shell out $299 a month. Busch, a radiologist and entrepreneur who has an 1800s-era home in Battery Place, a downtown Chattanooga neighborhood overlooking the Tennessee River, was the first to bite. "When I heard about the 10- gig thing, I thought, 'I definitely want to try that,'" he said. Busch needs it for work. 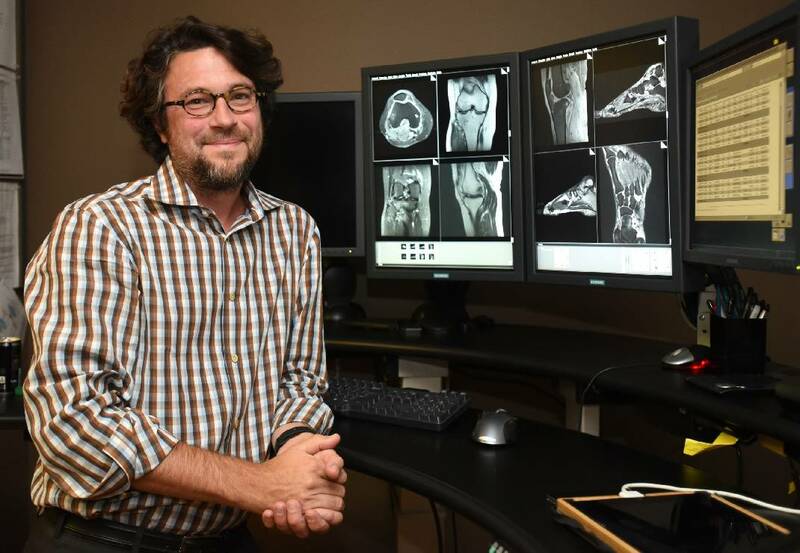 He's president of Diagnostic Radiology Consultants and frequently needs to download and upload massive diagnostic image files while he's at home. "Radiology is a 24/7 business," said Busch. The superfast connection will make it even faster than his former one-gigabit EPB connection to perform such tasks as look at a CT scan of a patient who comes into an emergency room in the middle of the night to see if they've got appendicitis. The 10-gig connection also will give more bandwidth at home for Busch's wife, who's online for her fashion design business, and the couple's three children, who download videos and communicate with friends via video calls. "Today's kids, they don't watch TV as much, they stream everything," said Busch, who said the family's online activities sometimes strain EPB's one-gig Internet. Staff Photo by Dan Henry / The Chattanooga Times Free Press- 10/15/15. Harold dePriest president/CEO of EPB speaks to media after a press conference announcing that residents of the Tennessee valley will have the opportunity to have the worlds fastest home 10-gig internet service. EPB's 10 Gig service is now available for access by every home and business in EPB's 600-square-mile service area, EPB said in a statement. The residential 10 gig service costs $299 a month with free installation, no contracts, and no cancellation fees, EPB says. EPB charges more for businesses that use the Internet more frequently, however. Small businesses can obtain the 10-gig service from EPB for $1,500 a month. The biggest professional business users will pay $9,000 a month for the 10-gig service. Like the "arms race" between the United States and U.S.S.R., Internet providers are in a sort of "gig race." For example, Comcast Corp. in May offered broadband speeds of two gigabits per second in Chattanooga and other cities. This "Gigabit Pro" was offered initially in Chattanooga for $159 a month, or just over half the usual $299 price. Comcast spokeswoman Sara Jo Walker declined to say Friday how many Chattanoogans had signed up for Gigabit Pro. "As a general company policy, we do not reveal subscriber numbers or customer information, but I can tell you that the customer response has been very strong," Walker said via email. Harold DePriest, EPB's president and CEO, said in a statement that Busch is the kind of customer who makes EPB proud to push the limits of network technology. 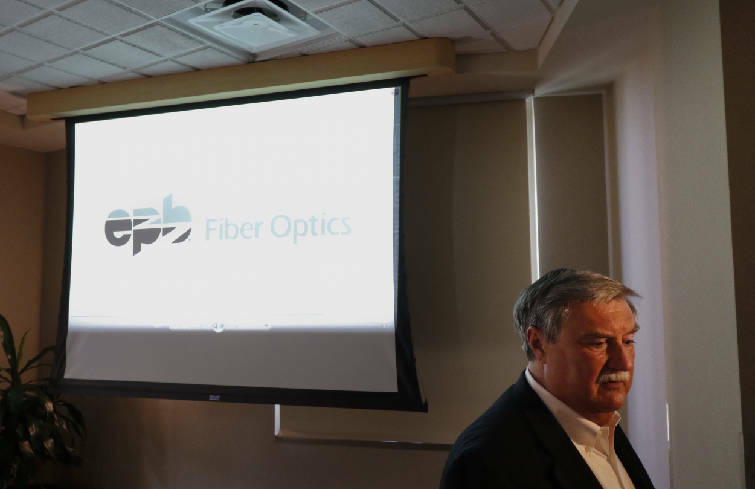 "EPB launched Chattanooga's community-wide fiber optic network to serve as a platform for innovation," DePriest said. "We can't wait to see how Dr. Busch and other enterprising individuals are going to use our new 10- gig service to push the boundaries in ventures ranging from healthcare and 3-D printing to film production and software development."